Paired with technology, Lemos’s personal cause has been to shift overall thinking around Afro-Brazilian talent in a corporate environment. In fact, her own journey in corporate Brazil is what helped her recognize a disparity in representation. Her time at Microsoft has helped her see the role that technology can play in evolving this lack of representation, while giving her the flexibility and internal platforms to help create change. “When I started my career at the Microsoft Brazil office in São Paulo as Services Inside Sales, I was responsible to sell Premier Support for the public sector’s customers considering my previous experience in this industry. By the second year, I became a service executive focused to sell MCS [Microsoft Consultancy Services] and Premier to a territory including insurance, banks, and construction customers. This fiscal year, I have changed my role to a service solution specialist professional for Premier Solutions, in charge of launching Microsoft Unified Support for Scale Accounts,” said Lemos. Of course, with any industry work, you must become familiar with every nuance and ways of doing business to best support the needs of the customer, a challenge that she welcomes. It’s in her nature. In fact, after earning her law degree, Lemos decided to follow the opportunities and took on a role in sales. “I had never been out of Brazil, but I chose follow my dream to live in Africa and stay for at least five years. I chose Mozambique because they spoke different languages [including her first language, Portuguese], and I heard that working in business sales without knowing the language is quite difficult,” said Lemos. Unfortunately, after temporarily falling ill, she had to leave the country before she made it to her five-year mark. Lemos returned to her hometown of Pelotas (in Rio Grande do Sul, Brazil) and weighed her options. After receiving offers from both Microsoft and another global leader, her dad encouraged her to follow the technology path. “He felt it could change the world,” she said. Soon after joining Microsoft, she quickly learned that he was right, and she was amazed at the technological advancements that the company had to offer, including Skype and Minecraft in the education sector. She recalls being a high school student in Brazil using dial-up and waiting to get online after midnight to not incur charges. At the university, she found it was better, but nothing like today’s internet. After three and a half years at Microsoft, she believes that technology holds the key to improving her home country. The 2010 census revealed a shift in Brazil’s population, where black and mixed-raced residents had become the majority, making up 50.7 percent of the population. However, Lemos notes that in the corporate space, a small percentage of this population is represented. Her mission has been to improve those numbers. Lisiane Lemos speaks about the disparity between the Afro-Brazilian population compared to the number of corporate Afro-Brazilian employees across the country. 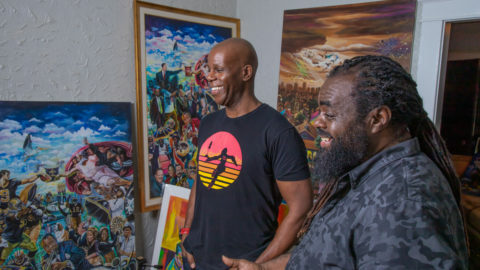 Along with other concerned Afro-Brazilian and Afro-Caribbean peers, Lemos founded the Black Professional Network, a Facebook group that quickly grew to 4,000 members in just one year. The group’s charter is to connect young black professionals with leading companies seeking to tap into their talent. She is also an active member of Microsoft’s Blacks at Microsoft group (Brazil chapter). Vocal, active, and undeterred, Lemos said that people are often shocked by her ability to successfully balance a demanding role and focus on driving positive change in her community. Lemos’s balancing act has not gone unnoticed. In fact, a vice president at a large US-based banking corporation who she met through a women’s organization nominated her for Forbes’ annual list of Brazilian leaders under the age of 30. “I was shocked because it’s usually filled with artists, sports people, and creative people. It’s rare to see business representation, especially for black professionals,” Lemos said. She just recently participated in a TedTalk, focusing on the ethnic disparity she has witnessed in the corporate space and the steps required to strengthen the workforce with talented, black candidates. “I talked about my journey since childhood, fighting racism, and how being at Microsoft helped me on trying to transform the Brazilian market,” said Lemos. Yet, she suggests that women should not discount their male counterparts. The goal is equality; however, it’s important to have male allies that understand that women can bring viable skills to the table and should never be overlooked. Lisiane Lemos advises others to find a way to differentiate and not abandon your personal cause when standing out among your colleagues within the tech world. As for other women who are considering the world of technology without abandoning their own personal causes, she adds that strength is key.